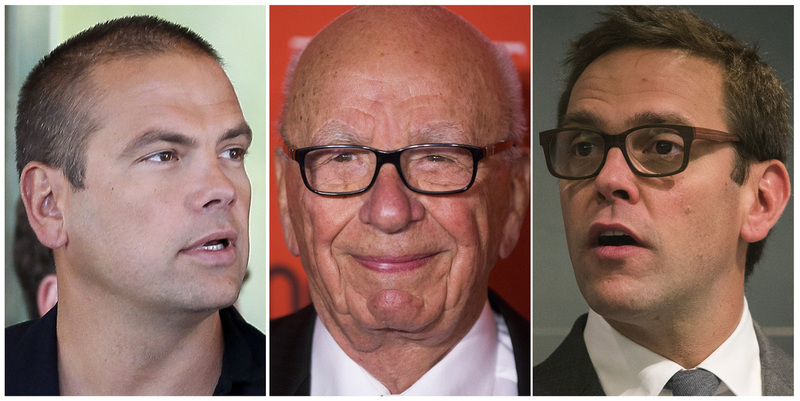 Rupert Murdoch Poised To Step Down As CEO Of 21st Century Fox : The Two-Way His son James is expected to become head of the company, while Murdoch will stay on as chairman of the boards of both 21st Century Fox and News Corp.
Rupert Murdoch (center) and his sons Lachlan (left) and James (right) are seen in a combination of file photos. Rupert Murdoch, the head of News Corp. and the Fox media empire, says he will hand over the reins of the company. Rupert Murdoch, the 84-year-old Australian-born media baron, says he will step down as head of the global media empire 21st Century Fox, handing the reins to his son James. A source has confirmed to NPR's David Folkenflik that James Murdoch would become head of the company. The elder Murdoch will become co-executive chairman with another son, Lachlan. NPR's Yuki Noguchi reports that the company has not confirmed its transition plan, which was first reported by CNBC, but said in a statement that the issue of succession is coming up at a board meeting. The Murdoch media dynasty includes not only Fox's film and cable business, but also News Corp. and The Wall Street Journal. Sources say Murdoch will continue to be a force at both Fox and News Corp.
"This restructuring will not necessarily clarify which of Murdoch's sons eventually takes over the running of the global media business. "The news was leaked ahead of this board meeting due to take place in New York next week." The elder Murdoch set the succession plan in motion last year by naming James co-chief operating officer at 21st Century Fox and Lachlan to the post at News Corp.
Reuters notes: "In interviews, some top investors who know James, and other people familiar with the company, describe him as curious and a risk taker like his father. But they also cite two big differences that they like: James is less sentimental about certain assets than his father and he is more enthusiastic about courting shareholders."